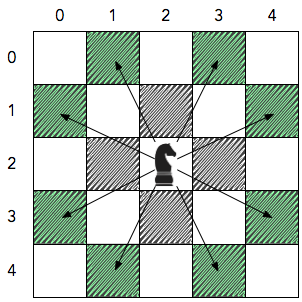 Observe that for each possible movement, the Knight moves 2 units in one direction (i.e., horizontal or vertical) and 1 unit in the perpendicular direction. 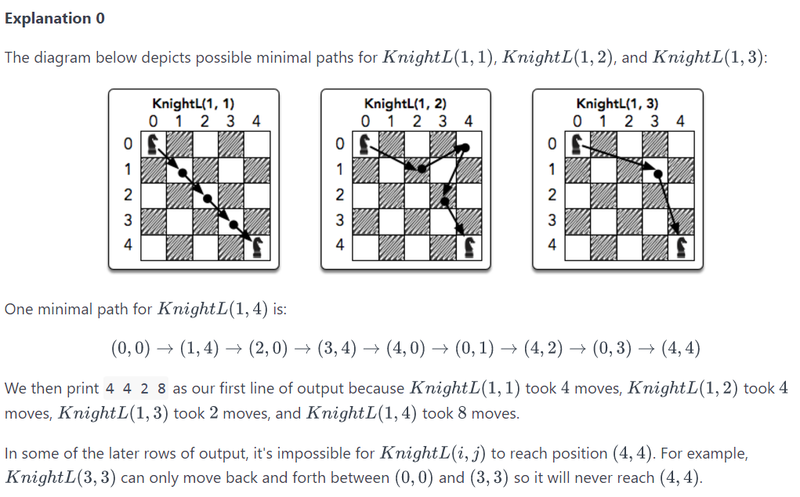 • What is the minimum number of moves it takes for KnightL(a,b) to get from position (0,0) to position (n-1, n-1)? If it's not possible for the Knight to reach that destination, the answer is -1 instead. Then print the answer for each KnightL(a,b) according to the Output Format specified below. A single integer denoting n.
Print exactly n - 1 lines of output in which each line i (where 1 ≤ i < n) contains n - 1 space-separated integers describing the minimum number of moves KnightL(i, j) must make for each respective j (where 1 ≤ j < n). If some KnightL(i, j) cannot reach position (n-1, n-1), print -1 instead. This is the first medium algorithm on Hackerrank RookieRank2 contest in Feb. 11, 2017, I played the contest and then I spent 1 hours 41 minutes to write the algorithm in C# programming language after I spent at least 20 minutes to understand the problem. The best performer only needs to take less than 20 minutes. I spent extra time in the contest to change the code from 4 directions to 8 directions after I failed some test cases, I should have worked on 8 possible directions to next move in the design before I start to write the code. The C# code passes all test cases on hackerrank. // do not continue, prune to save time. // there are 8 possible next moves in next knightL game, implementing in two steps. No need to use HashSet to mark visited nodes when a simple array of bool will do. When you find a solution, you keep going to find all solutions. However, since you are using a breadth first search, the first solution you find will be the shortest one, and you can return it immediately. You have a double loop to generate the 8 possible moves. It would be simpler to have a single loop of 8, or even to just use 8 hardcoded lines. Instead of using a Tuple<int, int> for coordinates, you can use a single int encoded as row * SIZE + col. Instead of returning a bool and also modifying a reference to an int, just return an int. If you don't find a solution, just return -1. You may notice that I did the breadth first search in a slightly different way. The search happens in "rounds", where each "round" handles all the possible positions at the current depth, while enqueuing the positions for the next depth. That way, the depth level doesn't have to be encoded into each item in the queue. Not the answer you're looking for? Browse other questions tagged c# object-oriented programming-challenge breadth-first-search chess or ask your own question.